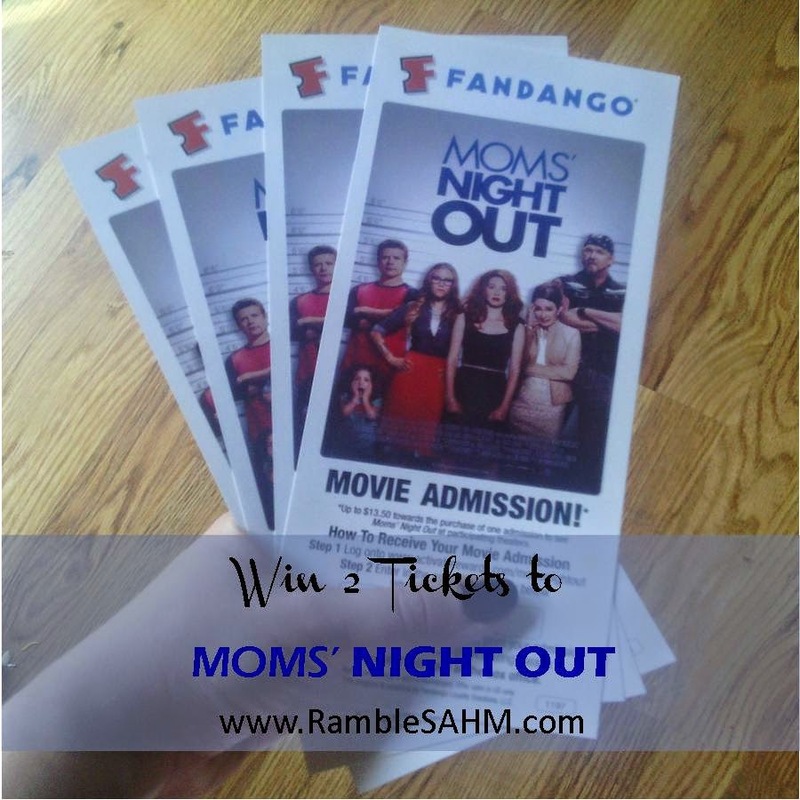 A little over a month ago we had the opportunity to see an advanced showing of Moms' Night Out. We laughed and we cried but most importantly we came away with a feeling of worth. What we do as mommas matters! One of the things we loved about his movie was that it didn't belittle the men in the movie. Sure there were funny scenes involving the dads, but they weren't scenes that made them look bad. This movie isn't just for the mommas, this movie is also for the dads. Are you wondering if the movie will be showing in your area? Go HERE to find a theater and pre-purchase tickets. The movie opens on Mothers' Day weekend, May 9th. We loved this movie so much and we are so excited to be able to giveaway two tickets to two of our readers! If you would like a chance at the tickets just use the Rafflecopter form below to enter. The contest is open to all U.S. residents ages 18 and over. My daughter and I saw it together. It was so much fun! Hope you and your mom get to see it together too. Take Kleenex for your eyes . . . you'll laugh so hard you cry and then you'll be so touched you'll cry again! Ha Ha Ha! You speak the truth my friend!!! If I had a magic wand I'd grant us all one. This movie is guaranteed to make you laugh! Then maybe you can have a glass of wine afterwards!!! It is funny! Can't wait for you all to see it!!! It is fun . . . don't think I've laughed this hard in a movie in quite some time. This does look fun! I'm needing a girl's night! I hope you get a FUN girl's night out VERY soon!!! Love the kiddos, but a night with adults only is lovely!!! Sounds like pure bliss . . . hope you get one VERY soon! I'd love to see a movie with my girlfriends and get a bite to eat afterwards. A true Girls Night Out! That would be so much fun and after seeing the movie you would have so much to talk about!!! dinner, drinks and a movie sounds pretty great. Yes it does! Hope you get one of those evenings VERY SOON!!! A nice dinner would be wonderful! I think so too. Nothing to prepare or clean up . . . just enjoy the food and the company! Me either! I'm looking forward to seeing it again with my husband. This looks so funny! I would love to take a girlfriend mom to this, maybe with dinner before! It is funny . . . and true to life . . . and touching. You're going to enjoy it! I vote for dinner also!!! I'm with you! And we LOVE our MOPS group here! All preschool mommas should have one! Sounds like a nice relaxing evening! I love to wander the mall even if I don't purchase a thing. Love the smells and the pretty new things! Good food and sightseeing downtown or at the beach! Sounds fabulous . . . especially the beach! The sound of waves is so soothing.